Royal Caribbean's Anthem of the Seas is a rather unique cruise ship, and offers some truly fun experiences that are certain to make memories for everyone in your group. Royal Caribbean packed a lot into this ship, but we picked seven aspects of the cruise experience that we really love and think you will too! Anthem of the Seas offers quite a variety of activities, with thrills, impressive technology and more dining options than you would know what to do with. Before you even step foot onto Anthem of the Seas, you will see one of the more prominent features of the ship, North Star. Royal Caribbean's North Star takes guests in an observation pod 300 feet above sea level for amazing views of the area around the ship. For the the first time ever, guests can get an amazing view around their cruise ship and take what is sure to become amazing photos of the scenery. Regardless of if you actually get a drink here, the Bionic Bar is an experience to itself onboard Anthem of the Seas. Two robot bartenders can make two drinks per minute, delivered in plastic cups via four conveyor belts. When we cruise on Quantum-class ships, we become self-diagnosed Two70 junkies. Two70 is the large, multi-purpose space at the aft of the ship offering some of the best entertainment onboard Anthem of the Seas. An undeniably cool innovation onboard Anthem of the Seas are the RFID bracelets known as WOW Bands. WOW Bands give guests everything they have been accustomed to having in a SeaPass card, on their wrist. This means getting access to staterooms, making purchases and checking in for entertainment has never been easier. 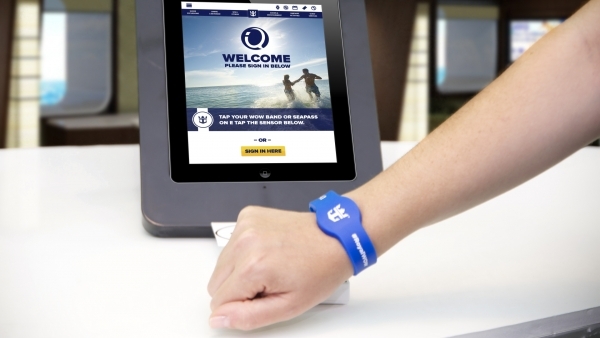 Guests can use their WOWband to enter their staterooms, purchase beverages, merchandise and anything else Royal Caribbean sells. Plus, WOWbands serve as an easy way to distinguish which muster station each guest is assigned to. WOW Bands are an optional feature, but once you try the WOW Bands, you will likely be leaving your SeaPass card behind in your stateroom. RipCord by iFly is a skydiving simulator that will be a first for cruise ships. Rather than descend from 10,000 feet in the sky, RipCord allows guests to get the sensation of skydiving without the incredible risk. Guests put on a jumpsuit and goggles and then soar up to 23 feet in the air for a two-minute adrenaline rush. Spanning two decks, the Music Hall lives up to its name with bands, musicians and DJs playing music for all to enjoy. If you want to jump into a crowd of people and put your hands into the air like you just don't care, then Music Hall is for you. This hip spot features live music in the evenings to get things started and that gets a crowd in of itself. But after the band is done, the DJ comes out and then Music Hall really comes alive. Guests onboard Royal Caribbean's Anthem of the Seas can get a real taste of New York when they dine in the Windjammer's New York Deli. Experience specially prepared deli favorites like pastrami sandwiches, rye bread and kosher pickles that the Big Apple is so well known for. Perhaps no space on Royal Caribbean's Anthem of the Seas is as innovative, impressive and down right fun as the aft-facing theater known as Two70. Two70 is an unique venue to the Quantum class of ships, and offers guests multiple experiences throughout the day that makes Two70 a hub of entertainment. This means, there is almost always something going on in Two70, and it has quickly become a favorite among guests. If you have a cruise booked on Anthem of the Seas, here is the important information to know about everything going on in Two70. Royal Caribbean offers a few different shows in Two70 to enjoy. Exact shows and schedules will depend on your sailing. Ordinarily, Two70's giant windows offer sweeping views of the ocean, but quickly those windows can be transformed into a theater experience with Vistarama. Vistarama transforms Two70’s floor-to-ceiling sea view into any scene, real or imagined. You will find cityscapes, glass windows, expansive rooms and a lot more. Vistarama is made possible by 18 projectors that combine to create an ambient surface over 100 feet wide and over 20 feet tall in stunning 12K resolution. Vistarama is not just a passive experience, because impromptu digital shows come to life at any point in the show. Simply put, Vistarama is a stunning display that is as beautiful as it is immense in scale. There will be different Vistarama shows throughout any given point in the cruise, so it is one of those experiences you need to stop by and see what is being shown. RoboShows are perhaps the most impressive use of the amazing troupe of six agile Roboscreens, that are capable of moving in many different directions and tells a story through the use of amazing technology, music and well-choreographed video. Each of the Roboscreens measures seven feet and is controlled by mega-powerful robotic arms. When working in tandem, the Roboscreens can twist, spin and move all around to offer a very impressive visual experience. Of course, the show is why guests should stop by, and there are a variety of different shows to see. Each is unique and it is something that has to be experiences to truly understand and enjoy. Spectra's Cabaret is an original Royal Caribbean production that is shown in the evenings and is a featured show onboard Anthem of the Seas. Trying to explain Spectra's Cabaret is not easy, but it features the Maestro and his Agents of Rhythm, whom take the audience through an, "an electric multi-dimensional cabaret" that involves singing, dancing, plenty of lighting effects, integration with the Roboscreens and much more. What is truly impressive about Spectra's Cabaret is that it is a multi-media extravaganza brimming with kaleidoscopic sounds, effervescent colors and dazzling movement. Spectra’s Cabaret blends live performance and experiential cinema along with music from popular culture. In short, it is like nothing you may have seen before. Royal Caribbean has built a reputation for offering terrific music on its cruise ships, and Two70 offers virtual concerts that are the next best thing to the real thing. In fact, it can be difficult sometimes to hear a difference. There are Virtual Concert & Virtual Symphony performances offered throughout Anthem of the Seas sailings, that feature performances by the American Philharmonic Orchestra or the Santa Fe & The Fat City Horns. This is a real concert that was recorded in ultra-high definition and broadcast on the amazing screens in Two70. There is a lot of entertainment offered in Two70, but some of it involves you. Often, there will be classes and lessons offered in Two70 during the day, where guests can go to learn about a certain topic. This can come in the form of dance classes, educational seminars and more. We have seen a lot of different kinds of classes offered here, including ballroom dance (which is quite popular), culinary lessons and jewelry making workshops. When evening turns to night, Two70 is transformed yet again into an adults-only nightclub. 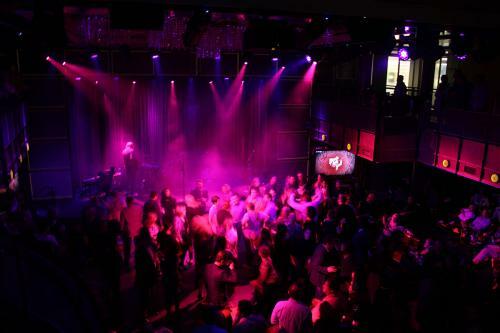 Club two70 offers plenty of music for adults to dance to, in a nightclub kind of experience. Loud music, flowing drinks and plenty of space to dance. With the large dance floor and ample seating, Club two70 is a mix of a lounge and club that should provide the right kind mix of both for guests looking to dance the night away. While there is lots of great entertainment in Two70, visiting this part of the ship is worth it just for the sweeping views available. Whether you are in port, or out at sea, there is always a very impressive landscape to enjoy. Two70 got its name by the fact it offers a two hundred and seventy degree view of the aft of the ship, and this means you can enjoy one of the best views on the ship, inside or outside. In truth, Two70 acts kind of like the ship's "living room," and like most living rooms, it is a great place to just sit back, relax, and enjoy the view from the comfort of a couch. It just would not be a Royal Caribbean cruise if there is not food conveniently located nearby, and adjacent to Two70 is the cafe that shares its name: Cafe @ Two70. Throughout the day, guests can get meals and snacks from Cafe @ Two70. By far, the best choice for food here is the Kummelweck Sandwich. This sandwich was first offered on Oasis-class ships, but is available on Anthem of the Seas in Cafe @ Two70. 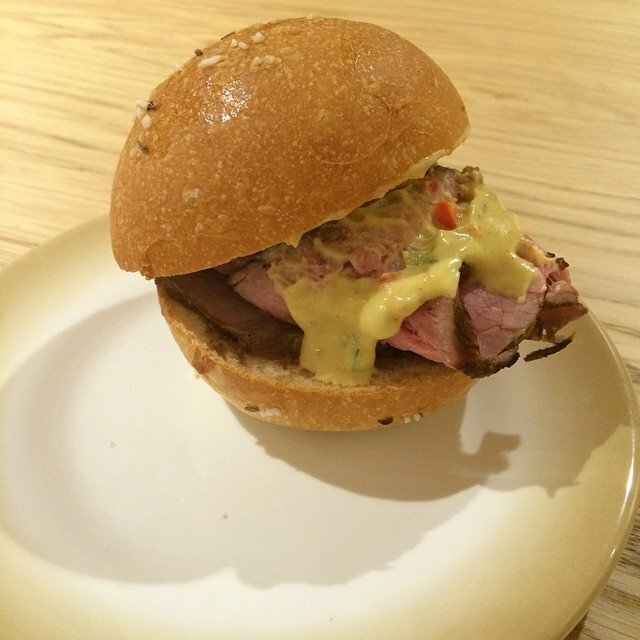 It is essentially a rare, thin cut of roast beef, dipped in au jus and served on a roll with a touch of horseradish. If it sounds mighty tasty, that is because it really is and something that is a must-try (at least a half dozen times) for any guest. There is plenty more of food served in Cafe @ Two70, and is a great less-crowded breakfast option. Regardless of which meal you choose to eat here, the best part is taking your food over to Two70 and enjoying the view with your food! If you like a view with your drink, head over to Two70 on one of Anthem of the Seas ships because it is hard to beat what you can see here. With all the goings-on in Two70, grabbing a drink at Two70's bar makes for the perfect accompaniment to any performance. Besides the view, the drink quality at this bar is quite good. In our experience, this bar tends to rely less on mixes and hand-crafts many of the drinks served here. This means the quality of the drinks are far often superior to other locations onboard. Have you been to Two70 on Anthem of the Seas? What is your favorite aspect of Two70? Which performance stands out as a real crowd pleaser? Share your opinion in our comments below! The hotel director on Royal Caribbean sees to every detail that impacts the guest experience. Watch as Hotel Director, Gary Davies, gives a behind-the-scenes look at managing the day-to-day operations onboard Anthem of the Seas to ensure a memorable vacation for guests. There are many important roles in Royal Caribbean, but perhaps no position is as highly coveted or admired as a ship’s Godmother. Every Royal Caribbean ship follows in the maritime tradition of naming someone to the role of ship’s Godmother and this week, we have the honor of having the Godmother of Anthem of the Seas to talk about her experience. Emma Wilby, through a contest, was named Anthem’s Godmother and in this episode, we will discuss the events leading up to her becoming the Godmother, share stories of her experiences as Godmother and talk about what makes Anthem of the Seas such an amazing cruise ship. Royal Caribbean's Anthem of the Seas had to head back to its homeport of Bayonne, New Jersey following an incident where a young child nearly drowned in the pool. In a statement by Royal Caribbean, the cruise line indicated an 8 year old boy had an accident in one of the ship's pool. The boy needed medical attention, so Anthem of the Seas sailed back to Bayonne. He is currently being treated at the hospital. Royal Caribbean's Care Team is providing support to his family. Royal Caribbean asked the public to keep the child in everyone's thoughts and prayers. For a limited time, Royal Caribbean is offering a Balcony Stateroom at Interior prices, as well as savings up to $300 per stateroom on Anthem of the Seas. The Anthem of the Seas Upgrade Bonus allows booking a balcony stateroom for the price of an interior stateroom at standard/full or 60% Off Second Guest fare. This offer applies to Anthem of the Seas sailings departing June 11 to December 16, 2016 and cruise must be booked May 2-June 6, 2016. This offer is combinable with the Crown & Anchor discounts and NextCruise offers, and Shareholder Benefits. Offer is not combinable with restricted rates (for example, Seniors, Residents, Military). Offer not combinable with any other offer or promotion, including, but not limited to, Standard Group, Interline, Travel Agent, Travel Agent Friends and Family, Weekly Sales Events, and Net Rates. Attention reality television fans, one of your favorites is enjoying a Royal Caribbean cruise vacation. Real Housewives of New York star, Dorinda Medley, is onboad Royal Caribbean's Anthem of the Seas with longtime love John Mahdessian. The couple is enjoying a Caribbean getaway, and has been spotted taking in panoramic views from 300 feet above sea level in Anthem’s iconic North Star; riding bumper cars in SeaPlex, the largest indoor active space at sea; lounging poolside in the ship’s adults-only Solarium; and previewing the new Royal Suite Class, launching May 2016. Royal Caribbean has produced a number of videos that show off the fitness options available on Anthem of the Seas. Former Dancing with the Stars fan favorite, Carlos PenaVega and friends, Emma Slater and Alec the Trainer, hit the gym onboard Anthem of the Seas to kick off their #FitAdventure. PenaVega's partnership with Royal Caribbean began earlier this year, when the cruise line announced he would be joining the cast of Grease on Harmony of the Seas. Watch as Chopped Open Your Basket challenges the culinary masters onboard Anthem of the Seas. Royal Caribbean chefs vie for the top spot by creating unique dishes with Caribbean flair from their baskets of mystery ingredients.